Lake Street Dive has come a long way since the 2012 debut of its YouTube video, a cover of the Jackson Five’s “I Want You Back.” With 9 albums and/or EPs to its credit, the Boston-founded, Brooklyn-based group has steadily built upon its successes. Lake Street Dive’s origins were built upon country and jazz, but today the band’s sound is both more mainstream and harder to pin down stylistically. After more than a decade as a quartet – drummer Mike Calabrese, Bridget Kearney on bass, Mike “McDuck” Olson on guitar and trumpet and Rachael Price on lead vocals – Lake Street Dive added a keyboardist in 2017. Akie Bermiss first joined the group as a touring musician, and is featured prominently on the band’s most recent releases, the 2018 album Free Yourself Up and a new EP of session outtakes, Freak Yourself Out. Olson says that the addition of Bermiss has changed the band’s approach to song arrangements. “Before we started touring with Akie, there were a lot of spaces” in the band’s sound, he explains. “Effectively being a power trio, our tendency was to fill up those spaces with oohs and ahhs and things of that nature, always heaping more things on.” With Berman adding keyboard textures, the other musicians all play a bit differently. The expanded lineup “frees me up to play more lead guitar versus constantly chunking out chords,” Olson says. Olson says that because Lake Street Dive’s music is rooted in what he describes as “a British invasion and soul rhythm section tradition,” many of the songs on the new album are more rooted in the bass/drums/guitar/vocals format. But fans of the group’s trumpet-adorned work need not go unsatisfied. The new EP features plenty of Olson’s horn playing. 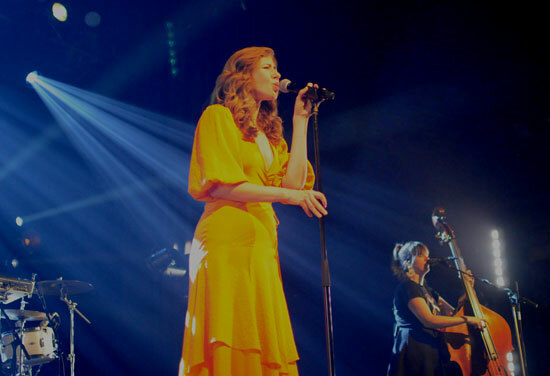 Lake Street Dive’s breakthrough 2012 EP Fun Machine was an mostly-covers collection, featuring reinventions of songs by George Michael, Paul McCartney and others. Coupled with the “I Want You Back” viral video (a version of that song is also on the EP), the release helped catapult the group into the wider public consciousness. Once again hedging his bets just a bit (“we don’t have any studio time booked,” he says), Olson allows that the band is considering “a followup to Fun Machine” in the near future. You may also enjoy my 2016 interview with Rachael Price.